When is a vocal studio not just a vocal studio? When it’s the Kathryn Lowdon Vocal studio, that’s when. Based in Bamburgh House on Market Street in Newcastle (also known as Breeze Creatives’ high tower of culture), Kathryn Lowdon provides vocal training and recording for everyone from beginners to professionals; the studio offers everything from regular singing lessons to confidence workshops, recording studio facilities to ‘ultimate music video experiences’. Kathryn is a fully-certified singing instructor who trained with Broadway coaches and Master Teachers from the US and Canada. She is also registered with the Institute of Vocal Advancement – this means that rather than making students practice in very specific vocal styles, you work on your muscles, breathing and other techniques to make your natural voice better and stronger, no matter what you’re actually singing. Lessons are also designed around the student, which means you can practice singing the songs you want in the style that you want. But the voice itself is only part of your performance. Kathryn is an expert in building stage presence and confidence as well as working on the vocals alone. She organises workshops to build on specific skills, like Confidence Workshops or Acting For Singers. She has trained with the Northern Guild for Psychotherapy to develop training techniques to overcome stage fright or other performance pressures. She also works with speech and language therapists and ENT specialists to help those with health problems rebuild their voices. Kathryn even offers Skype lessons for those who are living further away (or have just been caught in the fifteenth blizzard of our endless winter). Everyone from beginners to professional vocalists can benefit from just a few lessons – whether it’s a one-off session before a big audition, or a twice a week commitment. Kathryn added: “Lessons are available for children too – there’s no official minimum age, but instead I recommend that any child that can pay attention for thirty minutes will enjoy the session”. But what’s the point of all that practice if you’re not going to show it off? The studio offers regular student showcases and also has connections to some big competitions, including televised ones like The Voice and X Factor. You can also book recording sessions for a professional sample of your work for £80.00, or even a Music Video Experience for only £200.00. In even more exciting news, the Lowdon empire will be expanding in the near feature as Kathryn explained: “A new studio will be opening and we’ll be offering one-to-one instrument lessons in guitar, piano, drums, bass guitar, saxophone, trumpet and trombone, all lead by a group of fantastic musicians and teachers who trained just over the river at The Sage in Gateshead”. Prices for vocal lessons with Kathryn start from under £30.00 for a basic 30-minute lesson or a block of five 45-minute sessions for £150.00 (including the booking fee). 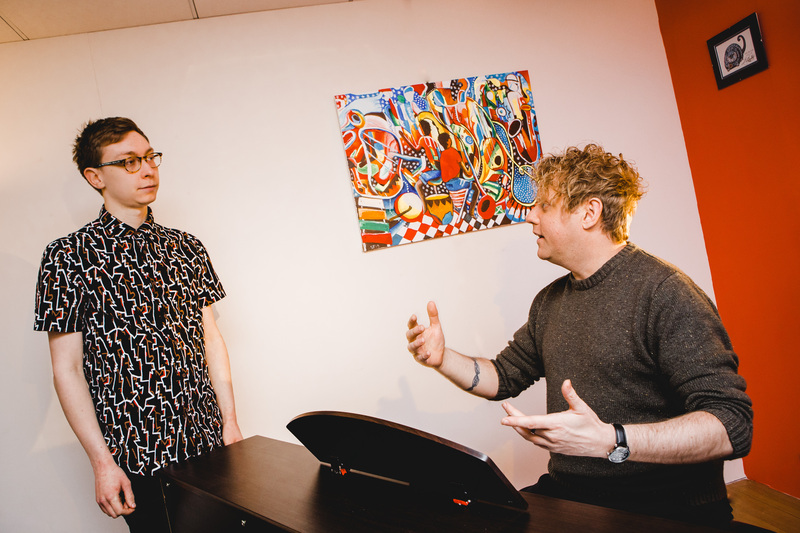 Students can also work with Jon Isbell, a new teacher who is currently working on his certification – £20 for a 30-minute lesson, or £120.00 for five 45-minute session block bookings. Gift vouchers are available too and they’ll make a perfect present for the serious singer or an occasional karaoke enthusiast. You can also catch Kathryn regularly singing with Kathryn Lowdon and the Soul Engineers, her soul band, if you’re looking for some local vocal inspiration. More details regarding the vocal studios can be found online at klvs.co.uk or on the Facebook page at Facebook.com/kathrynlowdonvocalstudio. The studio is open Mon-Thu and on Saturdays, and can be found in Bamburgh House, Market Street East, Newcastle Upon Tyne NE1 6BH.